As a developer I’m trying to better understand how developers work together with data scientists to build applications that leverage machine learning. In this context one key question is how developers can access models from their applications. Below is a quick introduction to TensorFlow Serving and a description how to deploy TensorFlow models onto the IBM Cloud. TensorFlow Serving can be deployed on Kubernetes which is documented in this tutorial. The tutorial shows how to deploy and access the InceptionV3 model which has been trained with 1.2 million images from ImageNet with 1000 classes. This model is a great starting point for your own visual recognition scenarios. See the retraining documentation for details. The tutorial describes how to build your own Docker image with TensorFlow Serving. Unfortunately there are quite a number of manual steps necessary at this point. If you just want to try the quality of the image recognition model, you can use the image that I created from DockerHub. In order to deploy this image on Kubernetes in the IBM Cloud save the file inception_k8s.yaml locally. Write down the IP address and NodePort since you need this information in the next step. 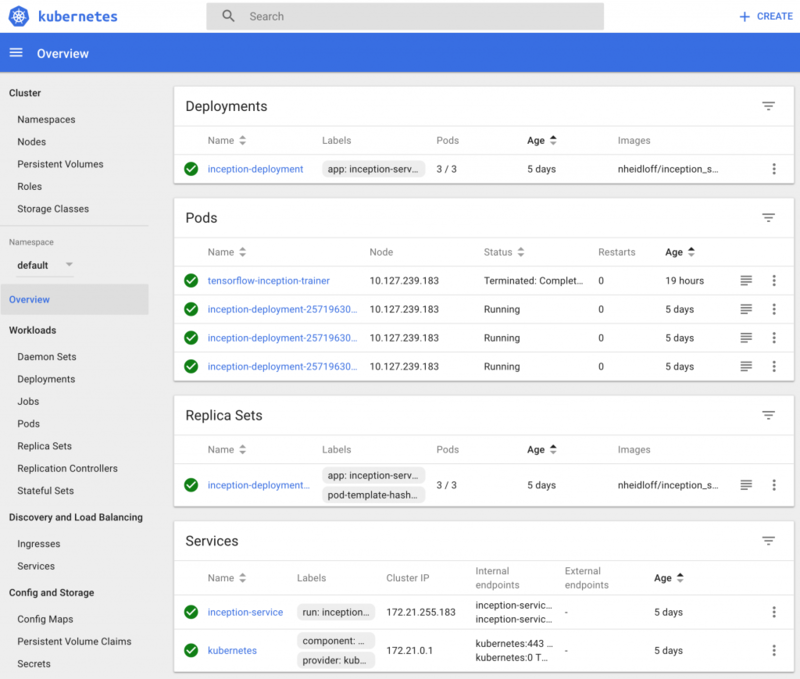 Also note that this works even for the lite Kubernetes account on IBM Cloud without Ingress. This is what you should see after everything has been deployed (‘$kubectl proxy’). TensorFlow Serving supports gRPC to access the models. In order to test the served model a test gRPC client is needed. In the simplest case you can use the same image since it comes with a test client. Here is a sample flow of commands to get the classes Inception returns for my picture. If you want to access the deployed models via REST instead of gRPC, you might want to check out this blog entry Creating REST API for TensorFlow models which looks promising and is on my list of things I’d like to try out.